They’re unpleasant. They’re uncooperative. And they’re unwilling to share. 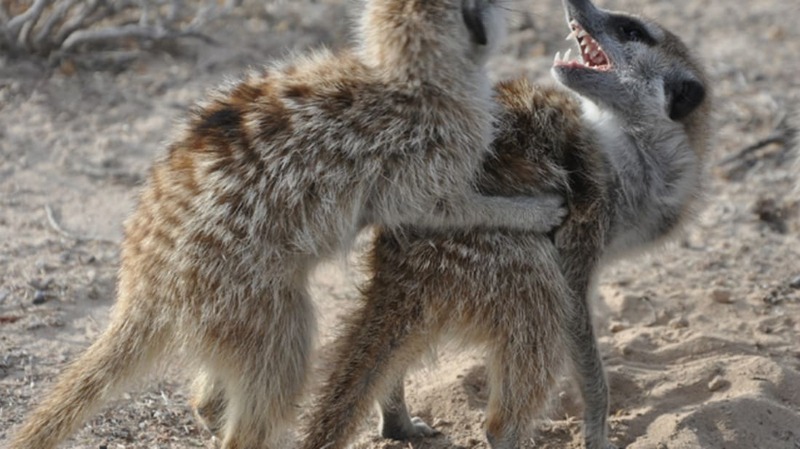 * Testosterone-fueled bad behavior is as common in meerkats as it is among other animals. But there’s one major difference: In meerkat society, scientists say, it’s the females doing the misbehaving. A report on their misconduct, and its implications for their health, was published in the journal Scientific Reports. Meerkats are intensely social animals. They live in tight-knit groups of up to 40 or 50 animals and do everything collectively, from hunting and sleeping to raising pups. They maintain order through a strict hierarchy led by a fierce matriarch and her subordinates. Meerkat matriarchs are notoriously self-involved, but other females are not much sweeter. They, and not the males, are the growlers, the biters, the brawlers, the food-swipers, and the warmongers—all identities traditionally associated with high levels of testosterone. To find out if the females’ bad attitudes were linked to this so-called male hormone, researchers collected blood and poop samples from 93 wild meerkat males and 91 females on the Kuruman River Reserve in South Africa. The meerkats there are habituated to scientists, which made it no big deal for the team to catch them, anesthetize them, and take a little blood. They’re also clearly tagged with individual dye markings, which made it easier for the researchers to tell who was chasing (or being chased by) whom. As anticipated, the blood tests showed a stark difference in hormone levels between male and female meerkats. The females’ blood boasted much more testosterone than the males’ blood did—in some cases almost double. Levels of testosterone and related hormones in females were closely linked with their place in the hierarchy. This was less true for males, whose hormones were more likely to fluctuate during mating periods. A testosterone-charged life doesn’t come without its costs. For meerkats, as with other animals, this may mean a compromised immune system. They combed through the meerkats’ feces and counted the number of parasite eggs they found in each sample. The higher a female’s testosterone level, the higher her parasite count—and the weaker her immune response. Riding high on testosterone may not make a lady meerkat popular, and it may not make her healthier, but all that jerk behavior could just give her—and her kids—a competitive edge. *National Geographic appears to have gone for a slightly different tagline.